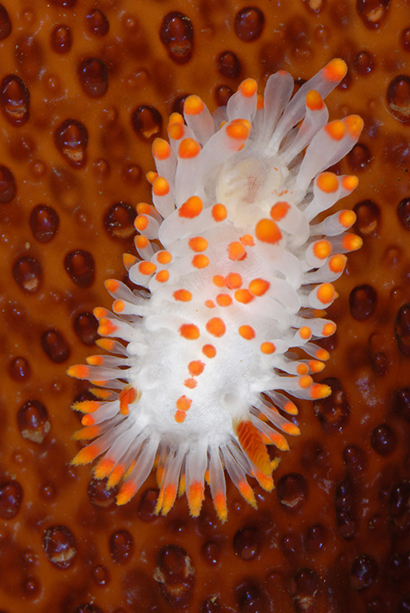 Researchers studying a colorful group of sea slugs (also called nudibranchs) found along the California coast have named a new species in honor of Gary McDonald, a long-time staff member at UCSC's Long Marine Laboratory. 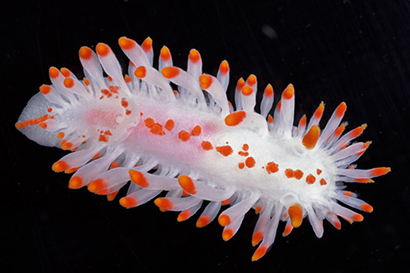 The new species, Limacia mcdonaldi (McDonald's dorid), is white with a striking pattern of orange-red coloring on the tips of small stalks and clubs on its body. About an inch long, it is found along the coast from Baja California to Sonoma County. Named in honor of Gary McDonald, who has spent decades studying and documenting California nudibranchs with exemplary care, precision, and generosity. His review of the nudibranchs of California (McDonald 1983), compilations of the literature, collection of specimens (housed at the California Academy of Sciences), and publicly available digital images have been exhaustive and continue to facilitate our research on nudibranchs from the Eastern Pacific. Coauthor Jeff Goddard, a marine biologist at UC Santa Barbara, said that as an undergraduate at UC Santa Cruz, he used to spend hours talking to McDonald about nudibranchs. "One of my favorite memories from back then was finding Gary in his office and talking shop about nudibranchs," Goddard said. "I learned a ton from him. This honor for Gary is long overdue." McDonald worked for the Institute of Marine Sciences for 32 years, doing a little bit of everything until his retirement in 2007. He helped build Long Marine Laboratory in the late 1970s, created the lab's public aquarium (the precursor to today's Seymour Marine Discovery Center), and eventually became the lab's computer specialist. His enthusiasm for nudibranchs was always something he pursued on the side. Since his retirement, McDonald has maintained his affiliation with the IMS as a research fellow. 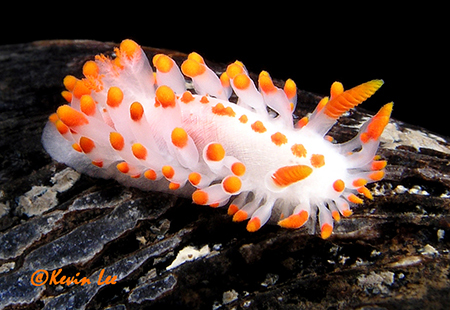 An accomplished photographer, he posts his photos of nudibranchs, flowers, insects, and other organisms on public natural history databases such as Cal Photos and iNaturalist.